With features that surpass traditional mop buckets, the new generation of WaveBrake® helps to clean floors with less effort to get the job done safer, without sacrificing quality and durability. IMPROVE SAFETY AND PRODUCTIVITY Patented WaveBrake baffles result in less splashing while mopping and maneuvering, helping to create a safer environment for patrons and staff. Additionally, water stays in the bucket, eliminating unnecessary trips to the storage closet to fill up the bucket, enhancing productivity. 80% LESS SPLASHING - Molded-in WaveBrake baffles disrupt wave formation, reducing splash up to 80% versus leading competitors. *versus competitive U.S. 35qt single compartment mop bucket and wringer, not including divider bucket and accessories. 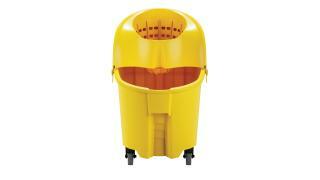 CONVENIENT TO EMPTY The new generation of the WaveBrake mop bucket is designed to safely empty water with less effort. Integrated handles, sink ledge, and a pout spout provide control while lifting and emptying, for a safe and stable emptying process. INTEGRATED HANDLES AND SINK LEDGE Lift and empty the mop bucket easily, with less strain. POUR SPOUT Helps prevent water from spilling on to floors while emptying dirty water, to help floor remain dry and safe. DESIGNED TO LAST The new generation WaveBrake wringer is designed and built to the highest of quality standards. WaveBrake wringers have an industry-leading warranty of 5-years. WRINGER Integrated handle on wringer for easy installation and removal. 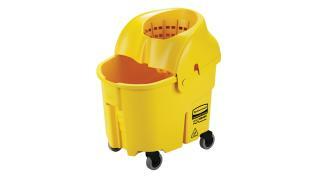 Wringer base is designed to stand upright when removed, to minimize bending while emptying the bucket. 5-YEAR WRINGER GUARANTEE The side-press and down-press wringers are designed to last 5-years or 200,000 cycles. SECURE WRINGER CONNECTIONS Integrated wringer-guides ensure a secure connection to mop bucket, providing stability while wringing and maneuvering, to help prevent spills. WRINGS A VARIETY OF MOP SIZES Wringer effectively wrings a variety of mop sizes, ranging from XS – XL (10oz – 32oz). DURABLE AND DEPENDABLE The new generation of WaveBrake is built to last, with features you can continue to depend on. DURABLE WRINGER HANDLE Handle is made from steel, with a comfort grip for long-lasting durability.